A combination of ayurvedic herbs used since ancient time for the treatment of High Blood Pressure, anxiety, tension, and insomnia. 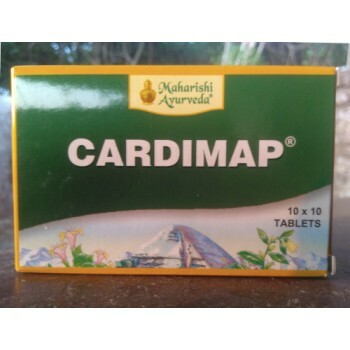 Cardimap has anti-hypertension and anti-anxiety properties, it is an effective stress-reliever and used to treat several neurological disorders. It is beneficial in the treatment of hysteria and it is also useful in alcoholism. Cardimap helps to relieve tension and it helps in cardiac arrhythmia through stress and anxiety by restoring the rhythm of the heartbeat. No side effects which may interfere with the continuation of treatment have been reported. Some patients may complain of drowsiness, disturbance in bowel movement, slight dis-orientation etc. which will promptly respond to adjustment in the dosage. Himalaya Herbals - Abana 60 Tablets A combination of ayurvedic herbs that are well known for ma..
Himalaya Herbals - Arjuna 60 Tablets Arjun herb has been used in Ayurveda since 2500 BC as a ca..
Alarsin - Arjin 100 Tablets A combination of herbo-mineral drugs that are used in Ayurveda sinc..
Himalaya Herbals - Lasuna (Garlic) 60 Tablets Well known as a culinary spice it has been used a..
Himalaya Herbals - Tagara 60 Tablets Valerian also is known as Tagara is available as a p..
Nagarjuna - Brahma Rasayana 300 g An ayurvedic formula rasayana from the group of the so-called..
Charak - Sumenta 30 Tablets The Natural anti-depressant and mood stabilizer.Benefits:Exerts anx..
Organic India - Vitality 60 Capsules A combination of herbs which relieves stress and is an exc..
Himalaya Herbals - Serpina 100 Tablets A herbal anti-anxiety and anti-hypertensive medication t..